Miracole Burns as Wonder Woman. Going to a Halloween party this weekend? Have the perfect, over-the-top, completely genre-accurate costume in mind to wear? Take it from some seasoned costumers and cosplayers – awesome costumes don’t survive crowds. Sometimes they don’t even survive the journey there. And sometimes, the costumes are so awesome that you can’t survive them. People like Chris and Miracole Burns, from “Avengers Assemble” and full-time cosplayer Yaya Han can make a living out of creating and wearing costumes. They’re invited to fan conventions to show up as comic book, anime, movie, TV and video game characters. They know how to create Hollywood-quality costumes and special effects makeup. They’re skilled at putting together the perfect look, the perfect pose, and making the whole package last for hours at a time on a crowded con floor. They also know that fellow fans are thrilled to see their characters “come to life” through these costumes - but such admiration can sink hours of hard work and hundreds, possibly thousands of dollars of investment in an outfit. For example, at this year’s San Diego Comic-Con, Miracole was asked to attend a friend’s event in her Wonder Woman costume, which is made of 20-guage, welded armor. “Somehow in the shipping it cracked two welds,” she said. “I didn't exactly have a blow-torch on me, so I went out and tried to purchase some JB Weld, which has a set time of 12 to 24 hours.” Despite the hardware store fix and a lot of money to Fed-Ex body armor from Atlanta, Georgia, to California, the costume didn’t hold up and Miracole had to bow out of the gig. “Typically a crash-kit for a costumer consists of a sewing machine, because you never know when you're going to pop a seam, superglue, Zap-a-Gap which works on things that are plastic-based, double-sided tape, spray paint,” she said. And let’s not forget duct tape. Where would a costumer be without duct tape? Velcro and duct tape are always in Miracole’s crash kit. “You have to think worst-case scenario and 'what do I have to do to fix it?' Because you could be walking around a con, you pop a stitch in the right place and that could be very interesting for photos later”. But some costumes are perilous to begin with, said Miracole’s husband and costuming partner Chris. Chris and Miracole both worked as costumers on the movie “X-Men First Class.” Miracole is such a huge X-Men fan that she made herself a replica Jean Grey costume. It’s a full leather suit, with gusseting around the knees and armpits. And she can barely move in it. “Leather doesn't have a lot of give. Especially with the way the costumes were designed and structured. So if you want to do a lot of posing, if you have a character that does a lot of crouching or has a lot of action-type poses, and you're wearing an all-leather suit, you can't do that,” Chris said. Anime and manga characters can be especially difficult to recreate, said Yaya Han, who has been an internationally in-demand cosplayer for the last twelve years. “Every cosplayer will have a moment where they literally are cursing some random Japanese guy for having designed such a reality-defying character. Like, 'How? Why did you do this?' she said. Han’s Carmilla costume from "Vampire Hunter D," is probably the most difficult costume she’s made to date. “What drew me to it was how outrageous her outfit looked. How the bodice was completely open in the front, her hair was completely crazy. I was like, 'I don't even know how I would make that. But because I don't know how I'm going to make it, I'm going to make it,'” she said. Japanese characters, especially, have costumes that magically stay in place. “Sometimes for modesty's sake you have to alter some outfits to make it appropriate for the public,” Han said. “Like my Felicia which is the blue-haired cat girl from ‘Dark Stalkers.’ She basically is wearing little fur bits around her breasts. So I altered them into a bra. It's not accurate, but I'm allowed to walk around at a convention,” she said. 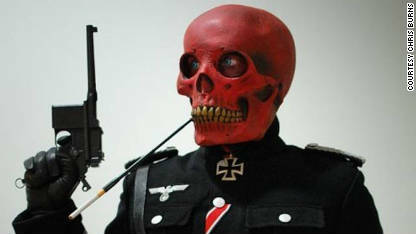 And then there’s something like Chris’s Red Skull (the WWII-era Captain America villain) costume. “The version I do is accurate to World War II, and an SS Nazi military uniform. Being accurate, it's made of wool. It's very uncomfortable to wear. It's super hot, it doesn't breathe, it's just a nightmare to wear the suit. But it looks great,” he said. Looks great, but functions like a sauna. In addition to the wool suit, there’s a fully-enclosed head mask, some makeup, contacts and a fully-lined, military-style, twenty-pound leather trench coat. Miracole’s Batgirl costume is not far behind. “My Batgirl costume is full silicone and then latex, which are two materials that don't breathe, at all. The only place on my body that shows actual skin is the area around my mouth,” she said. “I'm pretty prone to heat stroke if I'm not careful. I would rather suffer for my craft and doing this character to the best of my ability than look out for my own personal comfort. We definitely, as cosplayers, don't do it for the comfort,” she said. Heat stroke is probably not what the typical enthusiastic Halloween party-goer has in mind. Then again, skin-tight costumes are not the only rout to go when adopting a persona from a nerdy franchise. Storm trooper costumes, Chris points out, have plenty of comfort modifications, from built-in fans to helmet microphones. My cousin dressed up as SNOOKI, Nikole whatever.... Does that mean she is a bigot? Against Italians? Or Guidettes? Or whatever a SNOOKI is... Just curious. I was Liz Lemon from "30 Rock" for Halloween this year. She's my super hero, and the costume was super comfortable. Love the girl dressed as Wonder Woman. To quote H. Simpson ~ "She can tie me up with her magic lasso anytime!". I wish they included a pic of the girl dressed Batgirl. While many guys lusted after Catwoman, Batgirl was always my hotie of choice. I'll be dressing up as The Economy. Must be a pretty lean costume. going down on everyone all night long? "Storm trooper costumes, Chris points out, have plenty of comfort modifications, from built-in fans to helmet microphones." I'm an honorary member of the 501st Legion and help out at a lot of their events. Shame that this implies that Stormtrooper armor is comfortable. Heat stroke is just as much a risk when wearing a Stormie as any of the costumes mentioned. The fans are the same small ones you'd find inside your computer and are usually only be installed in the helmet (so very little help). Under the armor the guys wear full black bodysuits, often from scuba gear, which traps heat. There have been many times I've been honestly worried about my guys. Don't ruin my illusion! You guys (and girls) in the 501st are so awesome that I want to believe that you're totally comfortable and want to wear that all day! Dress up like Rick Perry or Michelle Bachman. That'll scare the hell out of a lot of people! I am a cosplayer and the worst part for my costumes is the full face mask for characters like Spiderman or Deadpool. Even with a good mask vision is often obstructed, they get hot, and to keep them from bunching up I often have to attach them to the neck of the costume...so to eat or drink i have to take part of the costume off in order to free my face. But it's always fun and worth the discomfort...and the 20 minutes it takes to take off all the weapons for the Deadpool costume just to go to the bathroom. I remeber when Wonder woman was TV and i called into the TV stastion asking to see more of her. Quit stealing my gimmick, brother! Well, the original complaint from actual Nazi SS was actually that the uniforms were horribly hot and sauna like, so I don't find it surprising that an accurate recreation would also be horrible. Personally, I'm going as Chell from the Portal games this year. The jumpsuit was easy to make and a quick run to Forever 21 combined with stenciling made my tanktop, but the leg braces proved somewhat trickier. I discovered that "foamies" sheets and model magic from the kids craft section are incredible. They have that smooth rounded sort of look from video games and are easily molded, carved, or glued into shape. A little electrical tape later and I'm golden! For instance, the most intricate costume I did (similar in quality to those pictured) cost around $1,500 in materials and too maybe 500 hours in labor. So...how do you figure that? Obviously I'm not billing for my own time, but if I billed someone else say, $30, we'd be looking at a $17,000 costume. The Chewbacca costume offended me and my Sasquatch brethren. Someone did. They call it a "Wampa" and I've seen some amazing costumes of them. That camilla costume looks like the chick from Turbo Rangers...hmm.. So you considered skeletons, asian vampire, and woman as a culture ?? vavoom... and I'm from Ohio, does that count? Ha ha ha! I enjoyed that comment. That article on the adds they are making ticked me off. Not that I am racist, but they didn't make one of a white person holding a picture of a colored person in a cowboy outfit. Not all white Americans are cowboys, but you don't see them getting mad. Besides....anyone ever watch the british show Top Gear? They constantly joke that ALL Americans are fat and weight 600lbs. First of all that is impossible and simply not true. People in other countries make fun of Americans worse than wearing a silly costume. Point is....discrimination comes in all forms and happens to EVERYONE. Not just foreigners that live in America. It happens to white Americans too. Get over your selves and get on with life. Quit worrying about what some white person is wearing and trying to blame them for something so ridiculous. Well said and Top Gear is a great show!